I’ve drawn it here MBA style, with a line on two axes, pretty much the way I first saw it, with a smooth curve from one extreme to the other. It’s almost symmetrical in this drawing, and would be even more so if I had better tools (who wants to devise an equation? I just drew it.) The idea is some sort of a conceptual break-even point between the two factors. There’s no amount of education that has much likelihood of success with no experience whatsoever. The curve should move slightly up and to the left. 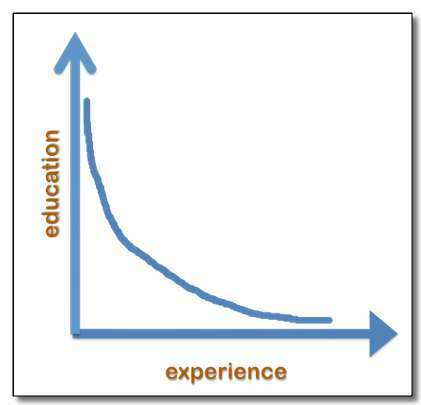 I believe the sweet spot on the curve is in the middle. My own experience with an MBA degree — which I got later than most, already 30+, but also before I started my own business, and was a co-founder of one that went public — was that the MBA gave me a general overview that made entrepreneurship easier. However, through several decades of working in this area, I’ve come to think that most MBAs need to temper all those analytical skills with real-world experience before they can really make progress. So an MBA five years out of biz school tends to be way more valuable than one who just graduated. Then again, I have an obvious bias. I’ve seen very little evidence that an undergraduate business degree increases likelihood of startup success more than a good undergraduate degree in science, math, engineering, or — yes, I’ll stand by this one — even liberal arts. In fact, I’ve seen a lot of evidence for the latter: that any other degree is a better indicator than a business degree. However, one big caveat: I’m guilty in the above of one-size-fits-all thinking. The huge bias towards my way of doing things. So take all of this as just one opinion. Do you agree? What are your thoughts? I posted it here because the discussion intrigues me, not because I think I’m right.